The Alinco DJ-V17 2 meter HT built to stand up to the elements!. It is ruggedly built to IPX7 standards meaning it can be submersed in 3 feet of water for up to 30 minutes. This 5 watt radio has 200 memories, and back-lit alphanumeric display and direct keypad frequency entry. The receive range is 130-173.995 MHz. Tuning steps are: 5, 10, 12.5, 15, 20, 25 and 30 kHz. A strong 500 mW audio amp provides big audio. A variety of charging adapters are available. Between me and my hnsuabd we&#8217;ve owned more MP3 players over the years than I can count, including Sansas, iRivers, iPods (classic &amp; touch), the Ibiza Rhapsody, etc. But, the last few years I&#8217;ve settled down to one line of players. Why? Because I was happy to discover how well-designed and fun to use the underappreciated (and widely mocked) Zunes are. The Alinco DM-330MVT is a variable voltage, switching power supply that delivers 5 to 15 VDC at 30 amps continuous or 32 amps surge. The combination of high-quality space-saving components and high efficiency switching technology make it possible for the DM-330MVT to be super-compact and still generate 30 amps continuous output. Alinco's communication technology has created a patent-pending Noise-Offset circuit to eliminate the pulse-noise of the switching circuit for the customer who demands more. The DM-330MVT comes with short circuit protection, a current-limiting system (over 32 amp) and extreme-temperature protection. The pre-set voltage function makes the DM-330MVT even easier to use. Just store the most frequently used voltage in the memory, and it is constantly ready to go. And of course it is easily varied. Convenience is another feature of the DM-330MVT! A cigar-plug socket (Max 10 amps), a set of Max 32 amps terminals, and two sets of snap-in terminals (Max 5 Amps) are provided. A large back-lit Amp/V meter displays the status of the power supply. Input voltage is 120 VAC. Ripple is less than 15mV p-p at rated load. 2 meter HT that sets new standards in features, convenience and easy operation. The DJ-195/196 sports an alphanumeric display for easy memory management. It has an ergonomic design that's "user friendly" and the 5 watt output battery is standard. You'll be ready to travel the world with CTCSS encode+decode, DCS and European tone bursts, all included at no extra cost. Best of all, the DJ-195/196 retains the proud Alinco tradition of quality construction and excellent value. 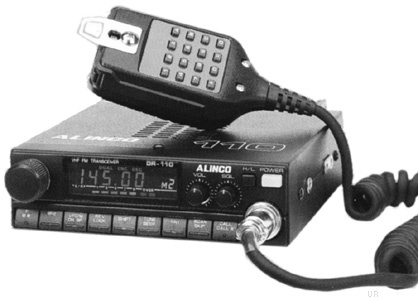 The Alinco DR-600T 2M/440 FM mobile rig lets you enjoy dual band operation at its best. It provides up to 45 watts output on 2 meters and 35 watts on 70 cm at three different power levels. There are separate knobs for volume/squelch on each band. You can even monitor both bands at once with simultaneous dual band receive. Crossband repeat is supported. You get a total of 40 memories: 28 regular, 1 call channel per band and 10 ARM (automatic repeater memory function). CTCSS encode is built in. Tuning steps: 5, 10, 12.5, 20 and 25 kHz. The back panel features separate pigtail antenna jacks for 2 meters (SO239) and 440 (N). Additionally, there are separate 8 ohm mini audio output jacks for VHF and UHF.